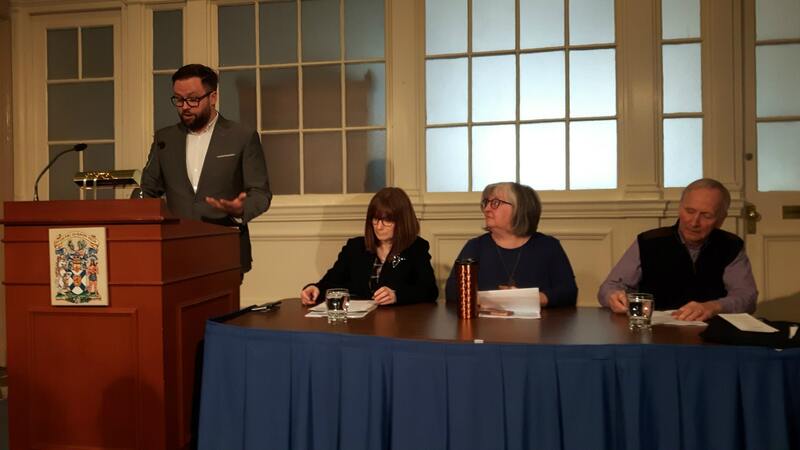 KJIPUKTUK (Halifax) – This morning’s launch of the Alternative Budget at Province House shows austerity isn’t the only way to run a province. In fact, it is the worst way. Year after year, come budget time in Nova Scotia’s Legislature, there is the release of the Alternative Budget by the Nova Scotia office of the Canadian Centre of Policy Alternatives (CCPA). Its collective of volunteer experts has been doing so since 2000. Although the highlights may change (this year it’s climate change and the green economy), in essence they’re always very similar. Regular people in Nova Scotia are made to suffer terribly in the name of this austerity. They’re asked to do without doctors, without affordable childcare, public transportation, deal with rising university tuition, rising rents, and a completely inadequate minimum wage. For people on income assistance, racialized people, people who live with disabilities, and other marginalized folks things are often unimaginably awful. “For the women we work with reducing poverty is priority number one. Increasing the minimum wage to $15 per hour is a great start, but so is increasing the income assistance rates to be actually adequate. A single person on social assistance receives only 38% below the poverty line, below what it really costs to meet your basic needs,” said Georgia Barnwell, presenter at this morning’s press conference and coordinator of Women’s Centres CONNECT, a coalition of nine women’s centres in the province. The provincial budget shapes almost all policies a government puts in place. Which is why these boring Alternative Budgets are also super important. Year after year the CCPA’s alternative budget for Nova Scotia suggests values like social inclusion and economic and environmental justice are things not only worth striving for, but are in fact affordable and within our reach. “The government must make spending and taxation decisions that benefit more of us. If it does not do so, and the decision making process is increasingly seen to favor the few, or pit workers against each other, the resulting lack of social empathy and economic opportunity can lead to instability. These are very real threats to our democracy,” said Christine Saulnier, director of the Nova Scotia CCPA, and the driving force behind these budgets for the last eight years. Download the Alternative Budget here, and check out its detailed proposals on inclusive green growth, poverty reduction, affordable housing, public transportation, early learning and childcare, life long learning, healthcare, climate action and tax fairness.